The MY 92.1 Fun Raisers - Creative Kids SK hasn't added a story. 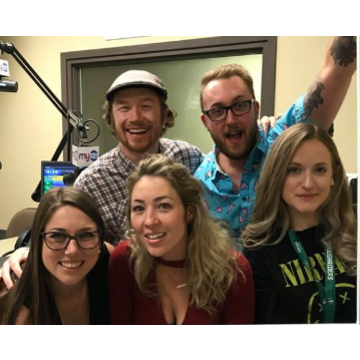 MY 92.1 is very excited to be raising money to benefit Creative Kids Saskatchewan! Did you know that Saskatchewan has one of the highest child poverty rates in all of Canada? Approximately one out of every 6 households in the province are below the poverty line. Over 30,000 Saskatchewan children have limited access to daily essentials, so activities like arts & culture are often beyond families' budgets. That's where Creative Kids Saskatchewan comes in! Creative Kids is a non-profit organization that allows kids to experience life-changing artistic and cultural experiences within Saskatchewan communities. They provide financial support to Saskatchewan families so that every child has the opportunity to be a part of activities such as music, art, heritage and dance. Participating in such activities greatly benefit the growth and development in children and youth. Let's help make sure every Saskatchewan child has the opportunity to experience these fundamental activities! Your donation is extremely appreciated. Casinos Regina and Moose Jaw are passionate about giving back to the communities in which they operate. By hosting the Charity Championships, the casinos are supporting numerous charities and non-profits through financial donations, and bringing people together for fun and fundraising with the aim to build a better community for our friends, family and future. We are competing against other charity crusaders to be the champions of our charity! On September 21, 2018, we will be participating in a fun and thrilling competition hosted by Bloodhound Games. 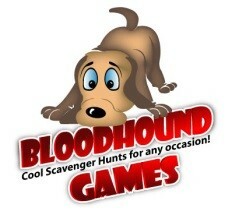 The event will feature scavenger hunts, puzzles and fun team challenges. The Game itself is approximately 2 hours in length and will take us (on foot) to various locations within the downtown area. The Game involves a series of team challenges, including problem solving, puzzles, and gathering of items in a specified time frame. Teams are awarded points based on the manner and time in which each challenge is completed. At the end of the hunt, points are tallied (including any point multipliers, see next section), and results are announced and all winners receive prizes! Here’s where the help of our friends comes in! The more money we raise, the more advantages we will receive in the Game. 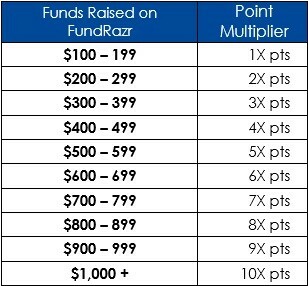 And in this case, it is a point-based multiplier and is determined on the amount of funds raised on our FundRazr page. See table below. Upon completion of the Game, team points will be tallied and the corresponding point multiplier will be applied. A social will take place at 5 p.m. at the Casino Regina Show Lounge. Here you can join us for music, drinks and free appetizers while we await our results! Competition Prizes: These prizes will go to the top 5 teams that accumulated the most points (including the points multiplier) and will be given to the team’s charity of choice. 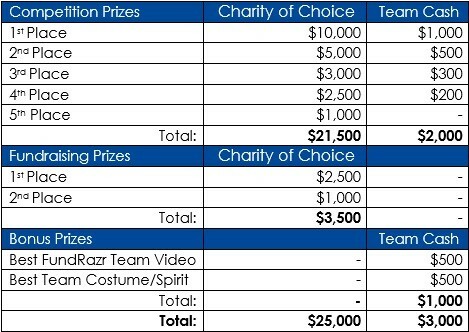 Fundraising Prizes: These prizes will go to the top 2 teams who raised the most money through their FundRazr team page and will be given to the team’s charity of choice. Bonus Prizes: These cash prizes will be awarded to the teams with the best FundRazr video and best team costume. These cash prizes will go directly to the team themselves. Best FundRazr Profile Video - $500: This cash prize goes to the team that had the most creative and capturing video on their FundRazr page, as voted by the Charity Championship Organizing Committee. Best Team Costume and Spirit - $500: This cash prize goes to the team with the best attitude, costumes, and sportsmanship, as voted by the Casino Regina volunteers. The MY 92.1 Fun Raisers - Creative Kids SK hasn't posted any updates yet. Casinos Regina & Moose Jaw Community Fund is managing the funds for this campaign. 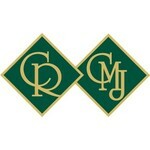 Casinos Regina & Moose Jaw Community Fund is a verified organization.